Komodo Edit can be used to add an email form to your website. The steps for adding an email form to your site using Komodo Edit are outlined below. Please note that this tutorial was created using Komodo Edit 5.0. The procedure may vary slightly if you are using a different version. Get started by generating your form HTML code using a free form service such as myContactForm.com. To get started doing this, please read this tutorial. Start Komodo Edit as you would normally do. a. To create a new page, go to File > New > New File (or press CTRL+N). b. To open the page where you want the form, go to File > Open > File (or press CTRL+O). a. 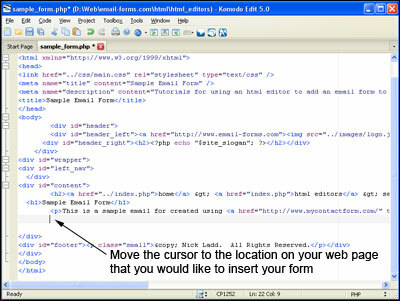 Move the cursor to the location within the HTML that you would like to locate the form. b. 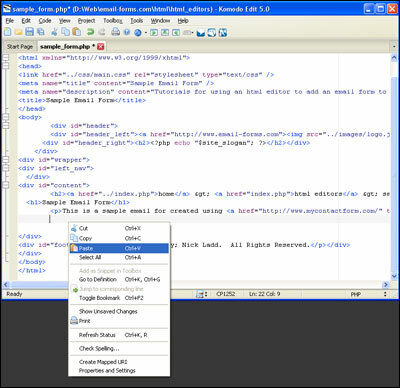 Paste the form HTML into the code (Edit > Paste, or CTRL+V, or Right Click and Select Paste). e. Click the View > Preview in Browser to ensure the form looks correct. The final step is to test the form to ensure that it is functioning properly. Open up the form in a web browser and send a test through. Check the email that is sent and verify that all of the details are correct. A demonstration form built using Komodo Edit can be seen here.